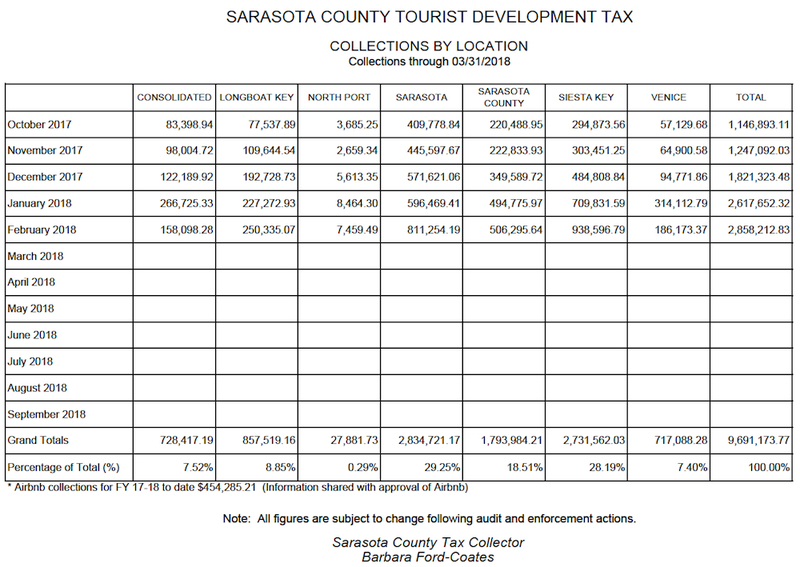 During a March presentation to the Sarasota County Tourist Development Council, Assistant Sarasota County Tax Collector Sherri Smith remarked that the latest Tourist Development Tax (TDT) revenue report showed collections already “up almost $750,000” compared to the figure for the same period of the 2017 fiscal year. Make that a difference of more than $1 million in “bed tax” money year-over-year, according to the most recent Tax Collector’s Office report. Through February, collections marked an increase of $1,049,576.68, compared to the revenue reported from October 2016 through February 2017. The February total of $2,858,212.83 was the highest thus far of the current fiscal year, which began on Oct. 1, 2017. Each month during the period reflected in the report has seen a higher figure than the previous month. The past two years, the county set records for the total amount of bed tax it collected. The money is divided among a number of “pots,” with revenue going to cover initiatives such as beach maintenance and renourishment, as well as debt service on the bonds the county issued to help pay for the Atlanta Braves’ new Spring Training complex underway in the West Villages near North Port. And the numbers could change. Audits and other revisions of the figures submitted to the Tax Collector’s Office each month by the entities that collect the tax can produce changes, Tax Collector Barbara Ford-Coates has explained. In fact, the latest report shows an increase of more than $39,000 for the January TDT figure. The numbers released last month showed total revenue was $163,499.19. However, the new report puts the figure at $201,956.66. 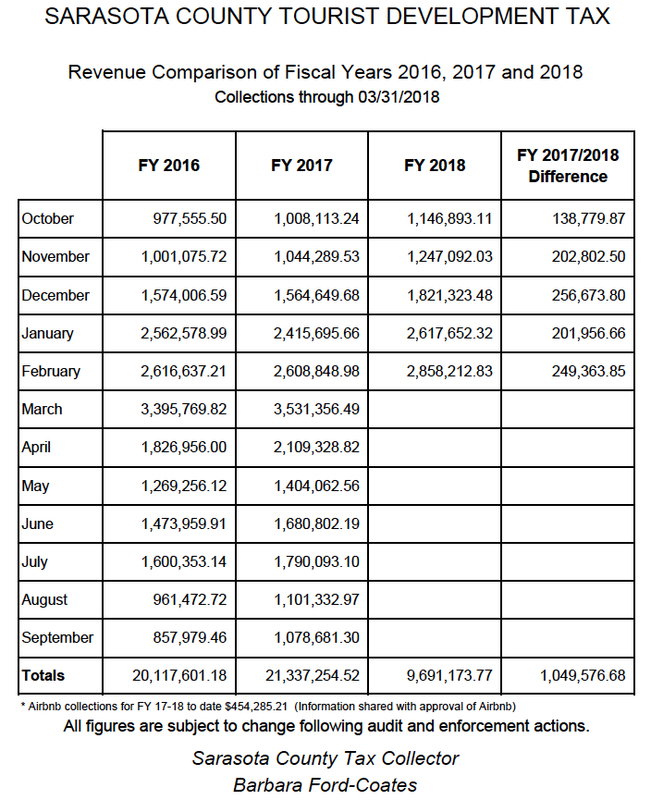 Conversely, the figure for October 2017 dropped a bit, from $139,379.87 in the report issued at the end of February to $138,779.87 in the March Tax Collector’s Office report. Overall, TDT revenue totals $9,691,173.77 for the first five months of this fiscal year. The location with the accommodations that have collected the highest percentage of that amount through the end of February is the city of Sarasota, with 29.25%. Siesta Key was in second place with 28.19%. Included in the figures are Airbnb collections from hosts who work through the internet-based accommodations service. The March 31 Tax Collector’s report says that, for current fiscal year, Airbnb revenue totals $454,285.21. In an April 3 press release, Airbnb announced that all of its hosts in the 12 Florida cities with teams in Major League Baseball’s Grapefruit League saw “significant spikes in Airbnb guest arrivals during the preseason baseball training as compared to the prior 5-week stretch.” For this year, that Spring Training period ran from Feb. 21 through March 27, the release pointed out. 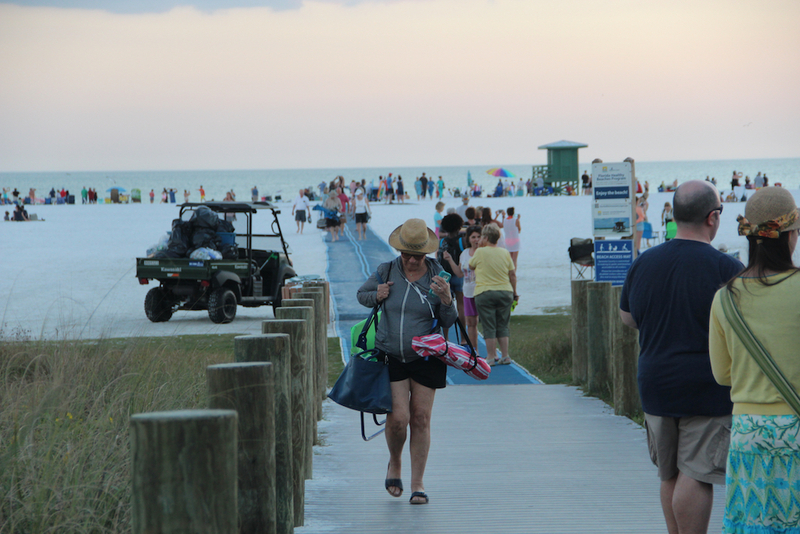 Among the data for specific cities, the release noted, Sarasota saw a “100% spike” in the number of Airbnb guests, compared to the figure for the 2017 period. The press release added that Sarasota Airbnb hosts welcomed 12,000 guests for Spring Training and earned $1.1 million from them. The Baltimore Orioles conduct Spring Training in Sarasota. Fifteen Major League Baseball teams hold Spring Training games in 12 Florida cities, primarily in Central and Southwest Florida, the release added.